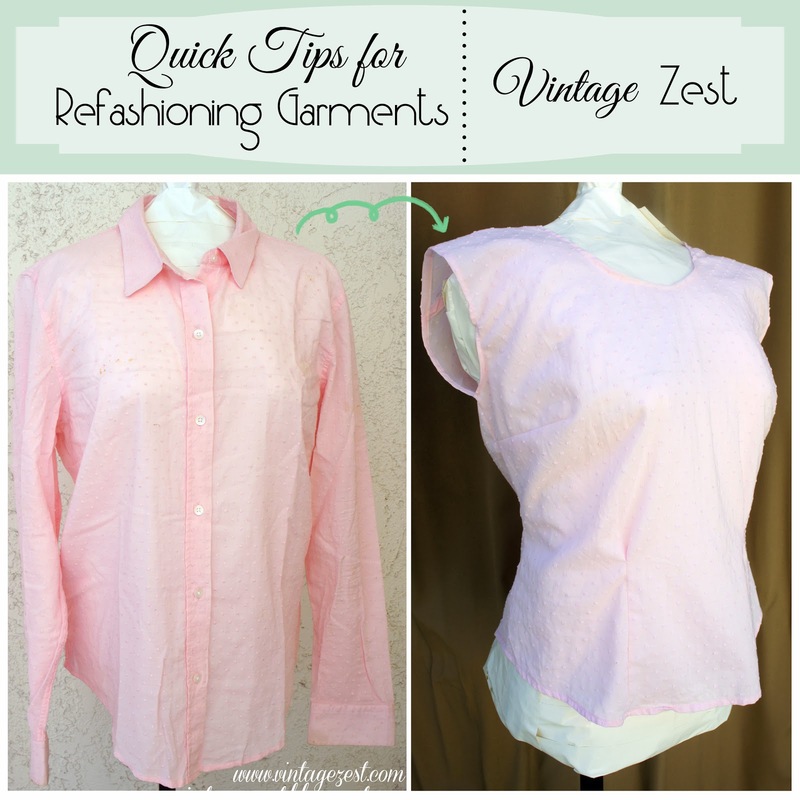 Quick Tips for Refashioning Garments ~ Diane's Vintage Zest! Although I'm not an expert, I have refashioned a few garments and I will definitely be refashioning more in the future. Why? There is a certain kind of satisfaction when you take something ugly or ill-fitting and turn it into something pretty to wear. It is like a makeover scene in a cheesy chick flick: ugly duckling to beautiful swan! I feel like that about my pretty Pink Portrait Blouse, which you will see in photos the below. Before I start, I know that a lot of you will have many more tips. Feel free to leave them in the comments so everyone can learn from your wisdom! Probably the most important thing to know is that if you are going to use a sewing pattern, you should err on the side of refashioning a garment MUCH larger than your current size. Pattern pieces are large, so you don't want to end up short! Pay attention to the things that are NOT working about the garment. Is it too frumpy, too long, or just not right for your body type? Think about how you can fix those issues, or even make it into a completely different garment type (i.e. - dress to top, pants to skirt, etc.)! Figure out what kind of garment you would like to make. If you don't have enough fabric, consider picking out a contrast or complementary fabric to go along with it. Focus on the details that you like in the garment and preserve them! I loved the buttons, so I kept it as a detail down the back of my top. Sometimes the details are the thing that will get the creative juices flowing! 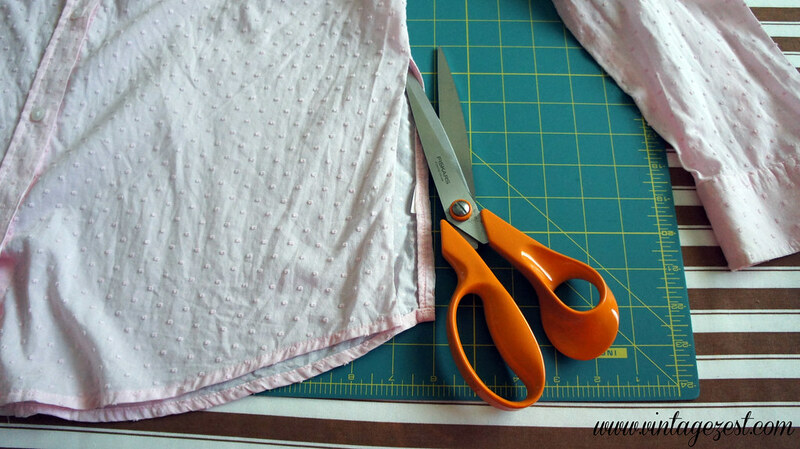 The easiest way to cut out a perfect pattern piece is to start out with a flat piece of fabric. Here are a few tips to get it flat. 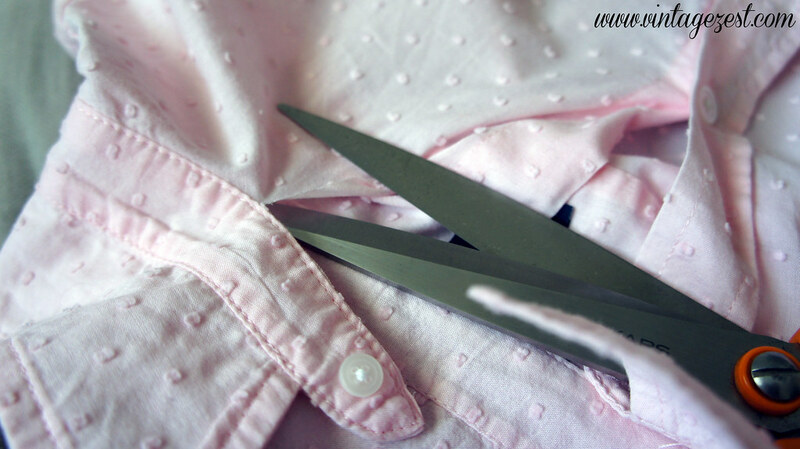 Treat your garment like your fabric and wash it before you cut! If it is an old garment, it has probably been washed a million times, so you can skip this step. Before you start to cut, make sure that your garment will be large enough just by laying the pattern pieces over your existing garment and eyeballing. If it looks way too small, you may have to get creative with your piece positioning or add in a different fabric. Separate any linings and remove interfacing with a seam ripper, if necessary. Cut out all of the bulky seams by cutting just to the inside of the seamline. In some cases you may want to preserve a pretty hemline detail, so keep it intact! It will also save you some sewing at the end. Score! Cut off bulky collars. I kept mine intact for a possible future project, but I'm not sure what yet. Into the fabric stash it goes! 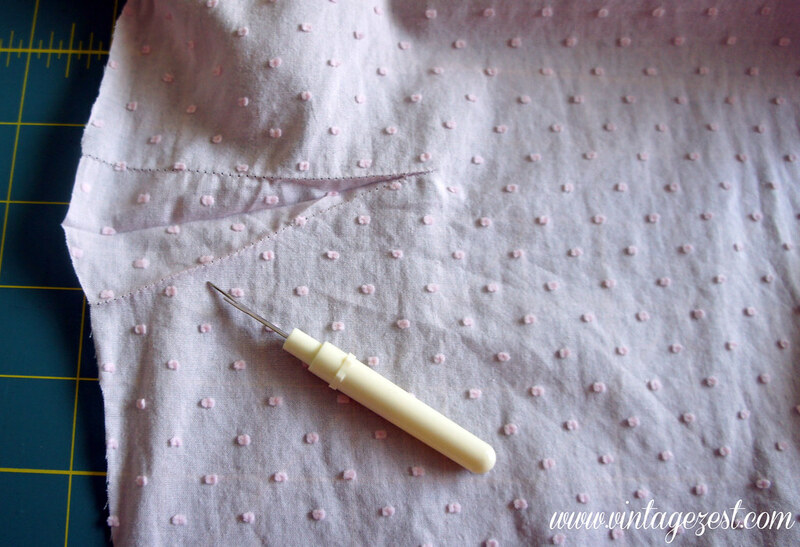 Remove any darts using your handy seam ripper so the fabric lays flat. Then iron it! Ideally, none of the dart will end up in your finished garment. If it ends up in your seam allowance, no big deal! Note: When I eyeballed the pattern pieces, my front piece was a bit small, so I had to keep the sleeves on. Treat your new pieces like it is regular fabric! The front of my shirt needed to be cut on the fold, so I folded my piece in half and laid it out flat. Remember, I needed to preserve my sleeves since it was a bit small, so yours will look much nicer and flat! Lay out your pattern piece and cut like normal! Here is my finished piece cut out and ready to sew! For more pictures of my Pink Portrait Top, read about it in this post! I hope I have shared a few helpful tips, and I would LOVE to hear more because I will be doing another refashion for our next Mad About Plaid Challenge! What is your best refashioning tip or trick? You know I'm in love with Refashion, I can't wait to see your Plaid project! I usually like to preserve something of the original garment to add a bit of flair. My other tip is not to be afraid of bleach or dye, it opens up the possibilities even more! Thanks! Fingers crossed that it turns out well! I know! I wish I kept some of my clothes that were pretty plain, so I could try to refashion them. Oh well, they went to good homes I'm sure. This came out so cute.. Cute top - love the way it turned out. Going to pin it so I have the idea. I love this. I just pinned it. Thank you so much for sharing with Wednesday's Adorned From Above Link Party. Have a great week. Great tips, thanks. I love a good refashion too, new clothes for free and completely unique.